Highly-pigmented, waterproof, smudge-proof, long-wearing gel eyeliner that applies with ease using an angle liner brush. 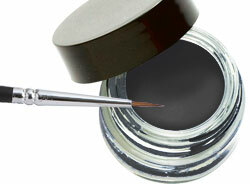 Indelible gel eyeliners are highly pigmented liners lasts all day without smudging or creasing. Jar contains 3 Grams of gel liner. If you haven't tried this yet, you should. The texture is creamy which makes it easy to apply, I find with some the texture is a little harder making it harder to apply. This stuff glides on like magic!